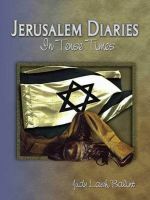 Jerusalem Diaries: In Tense Times is a compelling and moving account of life in Israel today. In a series of essays, author and Jerusalem resident Judy Lash Balint travels to the very heart of Israel. From embattled Jewish settlements in the Gaza Strip, to the home of the grieving family of a victim of the Ramallah lynching incident; from the barricades in Gilo under Arab fire, to the gas mask stations where Israeli citizens queue to collect their lifesaving equipment. These vivid descriptions piece together a stirring portrait of a people struggling to maintain normal life in the most abnormal of settings. Balint succeeds where the evening news and the most sophisticated media technologies fail. She chronicles the everyday existence of ordinary citizens, whose lives have been irrevocably altered by extraordinary events. The result is an absorbing and inspiring account of a nation and a country weathering a rough and relentless storm. Judy Lash Balint’s articles have appeared in the Christian Science Monitor, Jerusalem Post, The Forward, Seattle Times, Moment Magazine, The Jerusalem Report, Midstream, London Jewish Chronicle and numerous US Jewish weeklies. Ms. Balint is the recipient of the Mosaic Award for Excellence in Feature Writing about Israeli Peoplehood, Culture and Society and took second place in the 2003 Jerusalem Foundation's Excellence in Jerusalem Reporting contest.